The Speech and Debate team from Grand Canyon University consistently has performed well at competitions across the country, but this time it has outdone itself. Members of the Speech and Debate team display the plaques they won at the National Christian College Forensic Association’s National Championship in Salina, Kan.
GCU’s team earned the best finish in its history when it scored four titles – two team, two individual – at the National Christian College Forensic Association’s National Championship last weekend in Salina, Kan. Azusa Pacific University, Liberty University and California Baptist University were among the 20 college teams in attendance. Senior Tommee Gleason was ranked as the top overall speaker of the tournament in winning the speech national championship. Senior Xanthia Clow won the individual Persuasive Speaking national championship on the way to taking second place behind Gleason in the overall speaker awards. But Clow is in only her second year with the team and didn’t compete in speech and debate in high school. Sitting in Dvorak’s Argumentation and Advocacy class convinced her to give it a try. “Xanthia has really worked hard and put in extra effort to advance to the upper echelons of the competition,” Dvorak said. Additionally, the debate team of Alexia Parmer and Alexis Baskin placed second in the junior varsity division of Parliamentary Debate. Other members of the team were Kelliann Nash and Sam Hessman in speech and Reid Brodrick and Josh Vannoy in debate. 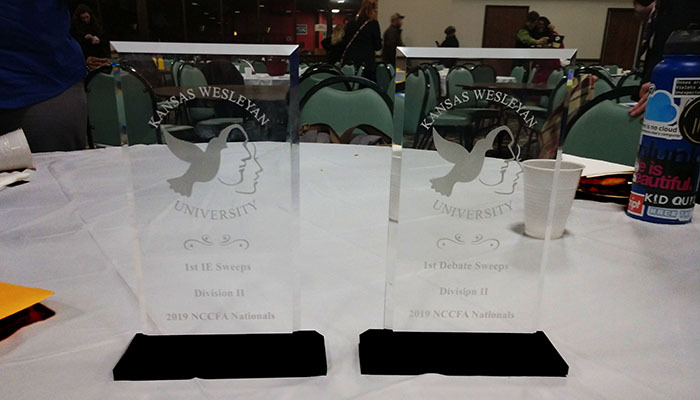 Thanks to all those top finishes, GCU earned the Division II national team championships for both speech and debate. But those weren’t GCU’s only weekend successes. The debate partnership of Matthew Calderwood and Grace Laidlaw was ranked in the top 32 in debate at the National Parliamentary Debate Association championships in Salt Lake City, which drew 107 teams from 36 colleges. Also at that competition, GCU’s novice team of Joseph Madere and Ben Kuykendal was ranked in the top four in its division. Debate will close out its season next weekend in Reno, Nev., at the National Parliamentary Tournament of Excellence. 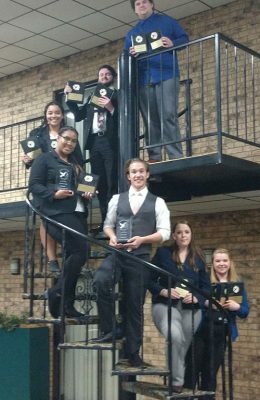 Speech will compete in its final tournament, the National Forensics Association’s national championship in Santa Ana, Calif., next month.